A selected blend 76% Pinot Noir and 24% Chardonnay from our estate vineyard in Bendigo, Central Otago. Bottle fermented and aged on lees. Riddled and disgorged by hand from late 2009. 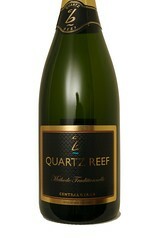 Quartz Reef Methode Traditionnelle is a wine of distinction, made in the traditional Champagne method to achieve elegance and finesse, at a cost that fits in with mere mortal proportions. This blend of 38% Pinot Noir and 62% Chardonnay from Bendigo, Central Otago shows Granny Smith with a hint of strawberries and cream on the nose with fruity acidity and leesy notes. Focused, fresh and crisp with a beautiful balance and length. Yum!